Muscle strength is built through a process of muscle fiber recruitment and an increase in muscle fiber size. In order to build muscle you have to engage in daily weight training sessions. Whether your goal is to add muscle bulk to your frame or to increase your muscular endurance, both are achieved through a process known as overload. The American College of Sports Medicine recommends adding resistance training to your fitness routine a minimum of two to three times per week. Your strength training program should include eight to 10 exercises that work the major muscle groups of your body with eight to 12 repetitions for two to three sets. Gains in strength are first through your muscle being able to coordinate a greater amount of muscle fibers contracting at the same time. Hypertrophy, an increase in fiber size, occurs with continued progressive overload. Choose an amount of weight to lift that is challenging – you should be capable of lifting without pain or extreme fatigue. Depending on which muscle group you are strengthening, the amount of weight will vary. Continue lifting the same amount of weight until you are able to complete to complete two sets of eight repetitions. Once you can complete two sets without fatigue, add another set. Increase the amount of weight during your next session if the weight is still easy to lift after increasing the number of sets you complete. Incorporate a day of rest in between each resistance training session in order to allow time for your muscles to recuperate. Alternate your resistance training sessions between strengthening your lower body and your upper body if you prefer to add resistance training to your daily fitness routine. Don't push yourself to complete exercises through extreme pain, this could cause injury to your muscles and hinder your progress and performance. 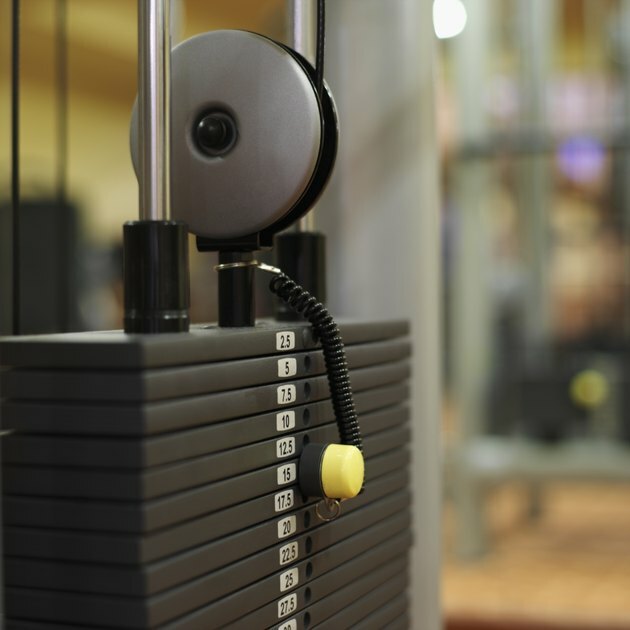 Many gyms have recommended weight training circuits that are coordinated with specific machines. Check with your gym staff or trainer to see what is available. Sometimes weight machines can allow for compensation between limbs – try reducing the weight and working out one side of your body at a time to train equally. Lift and lower the weight slowly – don’t allow it to bang back down when releasing. The lowering phase of the exercise is just as important as the lifting phase. Be realistic when choosing the amount of weight you will be lifting – lifting a weight too heavy straight out of the gate could delay your resistance training by causing injury. Don't hold your breath while weight lifting -- inhale during the lifting phase, and exhale during the lowering phase. Holding your breath can cause a dangerous spike in blood pressure. Check with your doctor or health professional before beginning an exercise program to make sure you are healthy enough for regular exercise. The Centers for Disease Control and Prevention: Muscle-Strengthening Activities – What Counts?